LUNAR contains 100% natural, safe substances that are scientifically proven to help you relax and fall asleep faster, stay asleep longer, sleep deeper, and wake up feeling rested, restored, and ready for the day. While our choice of ingredients alone sets LUNAR apart from the rest of the crowd, what really proves its superiority is that each ingredient is included at clinically effective dosages. That means that the dosage of each ingredient in LUNAR is based on published scientific research proving its benefits, not the restrictions of razor-thin production budgets or gluttonous profit margins. When you start comparing the actual numbers, you will quickly see that one serving of LUNAR contains several times the amount of effective ingredients as our best competitors’ products. And some of the ingredients just aren’t found together in other sleep supplements. While everyone claims to have the best sleep supplement on the market, we believe we can actually back up this claim with real science and real numbers. If you want to relax and fall asleep faster, sleep longer and deeper, and wake up feeling refreshed... without resorting to habit-forming drugs or supplements...then you want to try LUNAR today. According to polling conducted by the National Sleep Foundation, 43 percent of Americans between the ages of 13 and 64 say they rarely or never get a good night's sleep on weeknights. Sixty percent say that they experience a sleep problem every night or almost every night. Avoid caffeine, alcohol, nicotine, and other chemicals that interfere with sleep. As a general rule, don’t consume any sleep-disrupting chemicals four to six hours before going to bed. The more you view getting to bed on time as a non-negotiable part of your life, like diet and exercise, the better your sleep hygiene is going to be. Keep your bedroom dark, quiet, and cool, which are all cues for the brain to put the body to sleep. Don’t watch TV or use a computer, tablet, or smartphone for at least an hour before bed. Establish a relaxing pre-sleep routine. Soothing activities like taking a bath, reading a book, listening to calming music, and stretching or doing breathing exercises can help you sleep better. Avoid stressful or stimulating conversations or activities before bed. Don’t just lie in bed staring at the clock. This can heighten stress and cortisol levels, which can keep you awake. Instead, ignore the clock, and if you’re unable to fall asleep in a reasonable amount of time, get up and occupy yourself with a quiet, soothing activity like reading or listening to music until your eyes become droopy. Then go back to bed. Keep your body’s internal clock regulated by going to bed and waking up at the same time every day. Waking up at the same time despite when you went to bed is the best way to set your body’s clock and maintain it. Finish your workout at least three hours before bedtime to allow your cortisol levels and body temperature to drop, which are conducive to sleep. If you incorporate those habits into your lifestyle, you’ll likely sleep better than ever before. And if you want to sleep even better than that, then it makes sense to look to supplementation. And that’s why we created LUNAR. Research shows its natural, safe, and non-habit-forming ingredients help you fall asleep faster, enjoy longer and deeper sleep, and wake up feeling rested and rejuvenated, not groggy and lethargic. While the clinically effective dosages of key ingredients alone puts LUNAR light years ahead of other sleep aids on the market, there’s still more that sets it apart: what we leave out. And in case you’re worried that naturally sweetened means horrible tasting, you can rest easy. We’ve taken special care to ensure that LUNAR tastes great, mixes well, and goes down easy. We don’t use artificial food dyes in any of our products. Many sleep aid drinks contain artificial dyes, known as azo dyes, such as FD&C Yellow #5 (tartrazine), FD&C Blue #1 (Brilliant Blue), FD&C Red No. 40 (Allura Red AC), and others. LUNAR contains absolutely no “label stuffing” ingredients. We have a simple standard that we live by: every active ingredient used in LEGION products must be backed by published scientific literature and must be integrated at clinically effective dosages. How quickly will I see results with LUNAR? Many customers report immediate improvements in sleep quality with LUNAR. We were very careful when creating this formulation to avoid natural sleep aids known to cause side effects and/or withdrawal symptoms, such as valerian root, skullcap, and kava. Instead, we chose ingredients that are scientifically proven to help you relax, fall asleep faster, stay asleep longer, and wake up feeling refreshed...without unwanted side effects. Can I become addicted to LUNAR? None of the ingredients in Lunar are habit forming. Will LUNAR make it harder to wake up? You shouldn’t experience any abnormal morning grogginess with LUNAR. Will I become dependent on LUNAR for good sleep if I use it regularly? You will not become reliant on LUNAR to sleep well. If you stop use altogether, there are no residual effects. 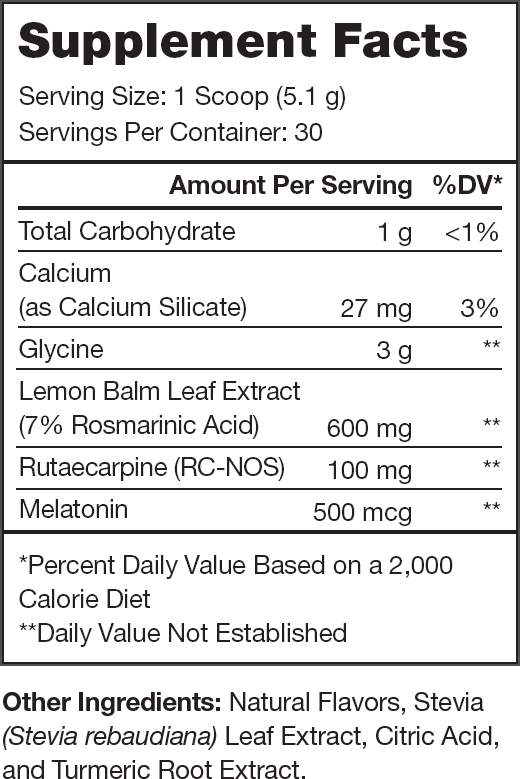 In the case of LUNAR, when you compare it to other sleep supplements, it looks like ours has “super-doses” of various ingredients like glycine and lemon balm extract. These dosages aren’t inordinately high, though. These are the amounts required to noticeably improve sleep. Why is there so little melatonin in LUNAR? That is, if taking a small amount doesn’t help you (and it may not--some people’s bodies don’t respond to melatonin supplementation), then taking more won’t, either. Furthermore, taking high amounts of melatonin increase the risk of side effects like difficulty waking up and morning lethargy and grogginess. You’ll know LUNAR is a real product by the results. If you’re like many of our customers, you’ll see immediate improvements in sleep quality once you start taking LUNAR. Why don’t you recommend that I use LUNAR every day? Because you can see diminished results with daily use. 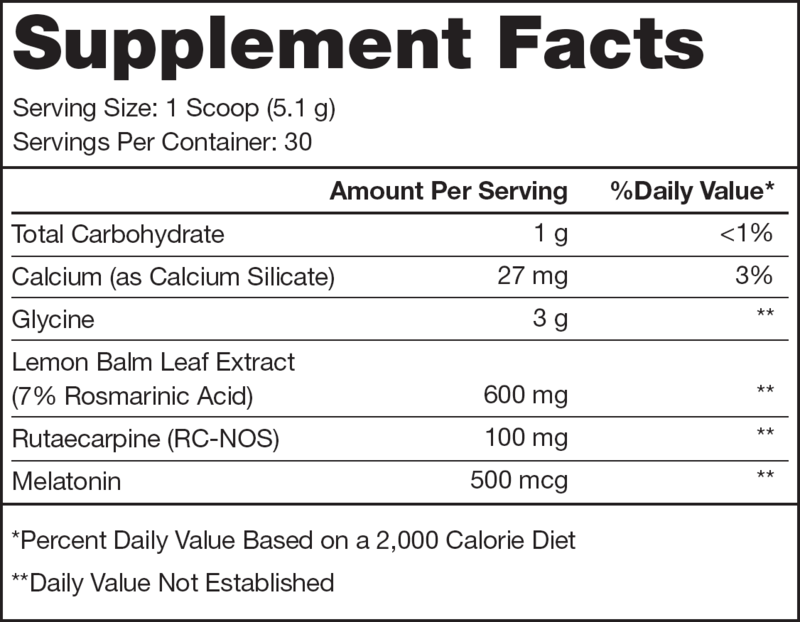 If you want to maximize its effectiveness, we recommend that you limit intake to 2 to 3 servings per week. LUNAR is too sweet/strong tasting for me. What should I do? 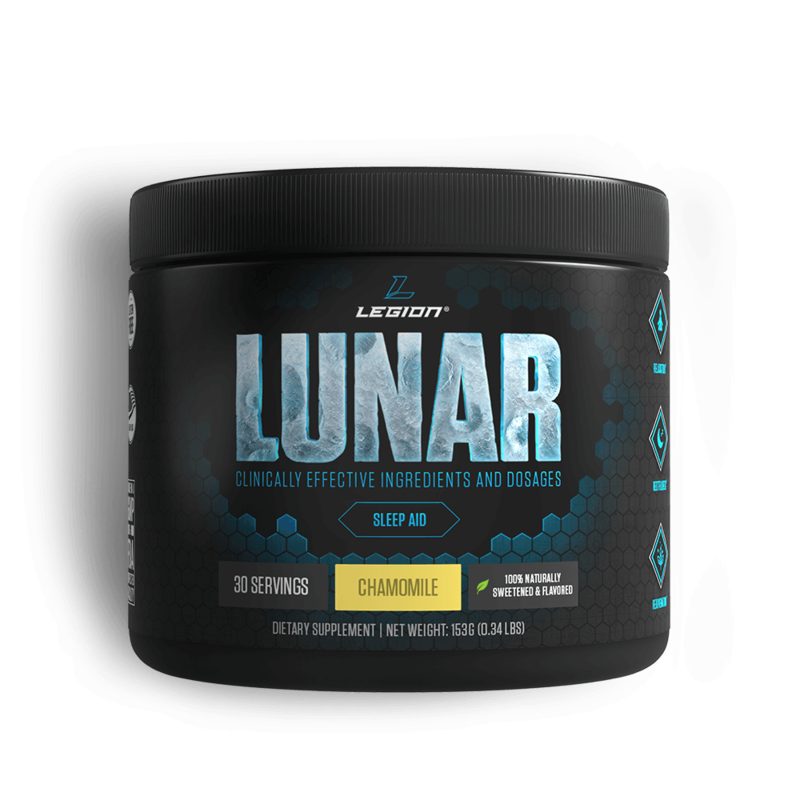 Also, we have tweaked LUNAR’s flavor profile several times since releasing it based on customer feedback, so please do let us know if you don’t like it.